I have written about the benefits of Pinterest in past AEA365 posts, but now I want to help you get started! Pinterest is a great resource for identifying visual trends in evaluation—it’s also pretty fun to use for your personal life. 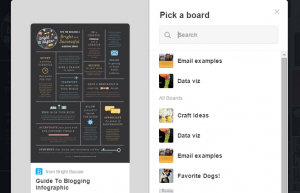 Pin: Pins are visual bookmarks that you collect on boards. You can save Pins you find on the Pinterest site or add new ones from your favorite websites or personal computer. Boards: Boards are where you save your Pins. You can make boards for anything and everything. Follow All: When you select “Follow all” you choose to follow all of someone’s boards, meaning all their boards are shown to you in real-time on your Pinterest Home Page. Follow Board: When you select “Follow board” you choose to follow and see updates on just one board from the individual’s profile. How to Join: Just go to Pinterest.com and click on the prompt to “Join.” () You can use your Facebook login to create an account or just develop a user name and password. If you use your Facebook account, the two platforms will be connected and your Facebook followers will be able to see your pins. Once you create an account, Pinterest will ask you to create a profile, where you can add a photo. Create a Board: Go to your profile and select the icon that says “Create a board.” This will open a form that prompts you for the name of your board, description, and category. People make boards for all sorts of topics and interests. Fo r example, data visualization info graphics, or even DIY all make great options for a board—the possibilities are endless. 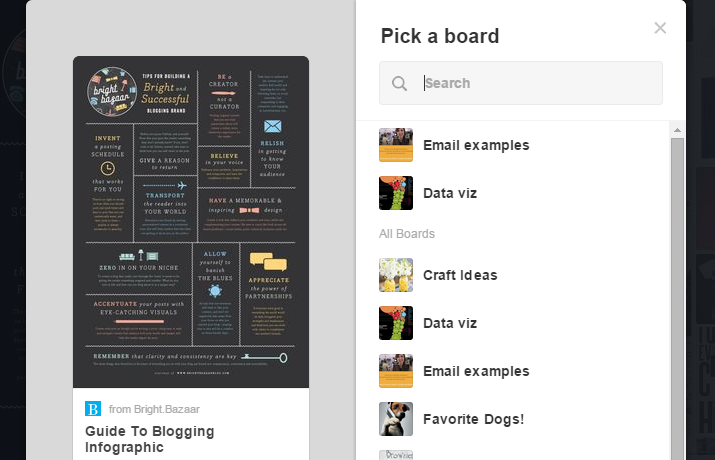 Add a Pin: Now comes the fun part—you can start pinning images to your boards! To find interesting images, you can either search for a specific topic by keyword, or choose a topic from the drop down selection (located on the end of the search bar). Select “Home Feed” from the drop down box to see the pins of others you are following. Once you find a pin that you like, hit the “Pin it” button at the top of the image. This will allow you to select the board you wish to pin the image to. Now if you visit your profile, you will see the image on your board and the source of the image for more information. You can also add pins from the web, by adding the Pinterest button to your browser or upload your own images from your computer. If you want to save an image but not necessarily add it to a board, you can like the image. Dive right in: Pinterest can be a bit overwhelming at first, by just dive in. 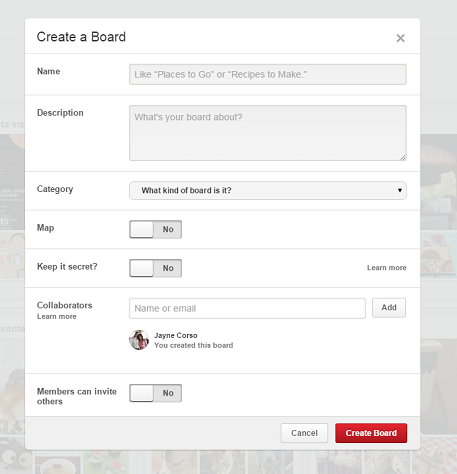 You will soon discover how intuitive it is to create boards, add pins, and browse the unlimited pins available on Pinterest. 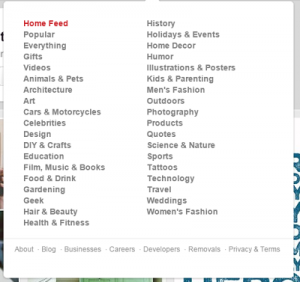 I must admit that Pinterest was a bit overwhelming when I first started using the page. It took me a while to actually learn how to post things on my board, find friends and search for specific interests. However, once I began to use it more often, it has become my favorite application! My favorite pins are recipes and I am thankful that they divided everything into specific categories across the top of the page. It makes finding specific interests so much easier. Thank you for your tips! What a cleaver idea! I had never thought of using Pinterest in my professional life. Could you give a few examples of key search words?